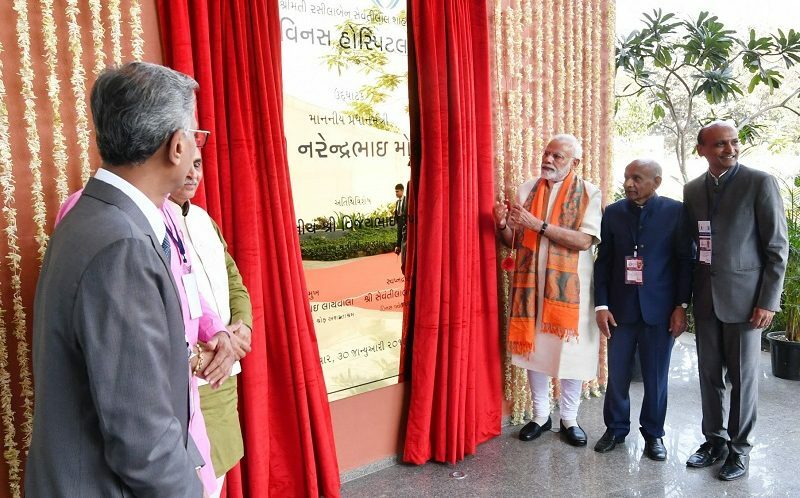 The Prime Minister Shri Narendra Modi today inaugurated state-of-the-art super speciality Rasilaben Sevantilal Shah Venus hospital in Surat. He expressed happiness that this hospital will also serve the people under the Ayushman Bharat Scheme. Addressing a public gathering, PM said that his government is working for a healthy India. He mentioned the pro-poor steps taken by the government. He said that initiatives like Pradhan Mantri Surakshit Matritva Abhiyaan and Mission Indradhanush played a vital role in the decline in the mortality rate. PM said that Ayushman Bharat Scheme will create an entirely new ecosystem which helps to create healthier India. The scheme will boost set up of new hospitals in tier 2-3 cities, which also increases job opportunities in the healthcare sector, he added. He said that more number of generic medicines are now available for the people which will not only reduce the cost of health care but also save many precious lives. PM also congratulates Gujarat for first implementing the 10% reservation quota for economically weaker section.